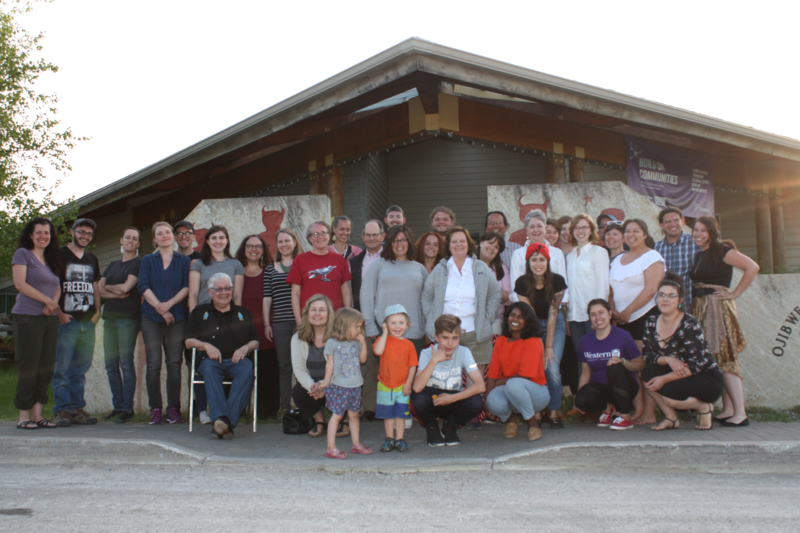 Anishinaabe holistic pedagogy and academic interdisciplinarity make a good fit, as we learned during a seven-day summer institute (MISHI) focused on exploring Anishinaabe worldviews through the lens of clans and generations. Co-sponsored by the Ojibwe Cultural Foundation (OCF), an organization devoted to Anishinaabe history and culture, and the History of Indigenous Peoples (HIP) Network, a research cluster embedded within the Robarts Centre for Canadian Studies at York University, and partnered with ActiveHistory.ca, MISHI brought together 32 established and emerging historians, graduate and undergraduate students, administrators, Elders, and knowledge-keepers to explore all things Anishinaabe through site visits, lectures, stories, and activities. Situated in northern Lake Huron, Manitoulin is the largest fresh-water island in the world and has been home to Indigenous peoples for more than 12,000 years. 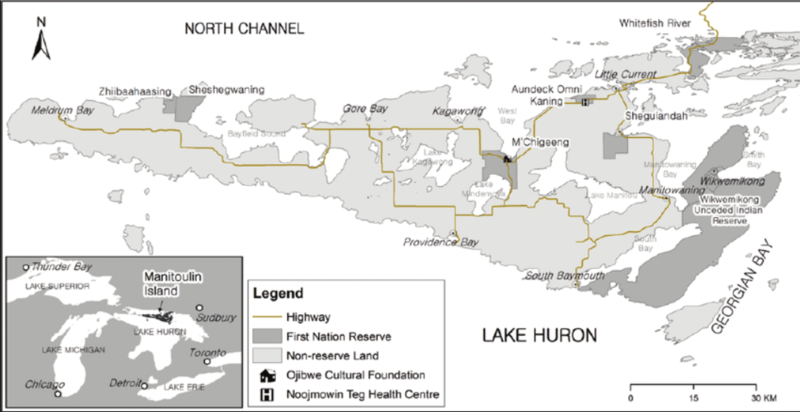 Today it has six Anishinaabe communities, the residents of which share close relations with First Nations on the north shore of Lake Huron, including Whitefish River, Sagamok, and Serpent River. Knowledge-keeper Alan Corbiere and Elder Lewis Debassige (both from M’Chigeeng) were the main instructors of the Institute. Another 19 presenters included scholars, artists, and local knowledge-keepers with distinct views of land-based pedagogies, including story-telling, hiking, cooking, and creating art. 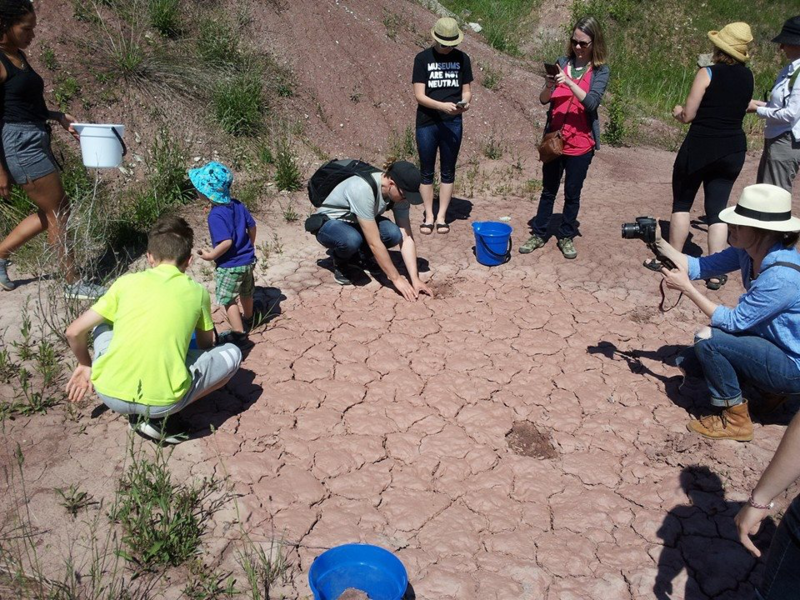 We began the institute on the land digging up naturally occurring clay to make pots and sculptures. 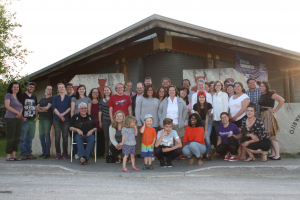 We gathered at the Mutchmore Café to hear Anong Beam and Laurentian University Professor of Archaeology Alicia Hawkins speak about the ancient village site at Providence Bay, where many of the participants were staying. They focused on the long practice of pottery production at the site, which challenges the interpretation that Anishinaabeg did not have an ancient ceramic practice. Professor Hawkins led the group on a walk to view the ancient village site. On the second day, knowledge carrier Peggy Pitwanakwat (Wikwemikong FN), the coordinator of First Peoples at Seneca College, officially opened MISHI with a prayer and an explanation of her doodemag. Elder Lewis Debassige introduced everyone to the OCF, discussing its history, mandate, and its many projects. Next, Deborah McGregor and Anong Beam discussed the ethics of working with Indigenous peoples and communities, underscoring the values of respect and courtesy. Participants then listened to Laurentian University Professor Darrel Manitowabi (Wikwemikong FN) explain his worldview, approach to education, and relationship with his doodemag. After lunch Lewis and Alan lead the group on a bus tour of the central part of the island, teaching key Anishinaabemowin phrases of greetings along the way. The group visited an art installation “Replenishment” (of sculpted boulders placed in the Kagawong River) by Anishinaabe artist Michael Belmore. The group next visited Ten Mile Point, the site of an ancient Jesuit mission and a lookout over the eastern shore of Lake Huron. We returned to the OCF for the opening feast, followed by a talk by Anishinaabe artist Leland Bell (Wikwemikong FN) on how his Anishinaabe worldview shapes his artistic practice. Our third day was devoted to recognizing the work of the Truth and Reconciliation Commission. In the morning two Survivors shared their experiences at the Spanish Residential School: Rita Corbiere (Wikwemikong FN) and Marion McGregor (Whitefish River FN), who both went on to become educators. The group then traveled to the site of the school. After our return, OCF Elder Leona Nahwegahbow (Whitefish River First Nation) conducted a healing ceremony. At dinner, the group attended the opening of the OCF art show “New Legends” by Travis Shilling (Chippewas of Rama FN), son of a residential school survivor and critically acclaimed artist Arthur Shilling. 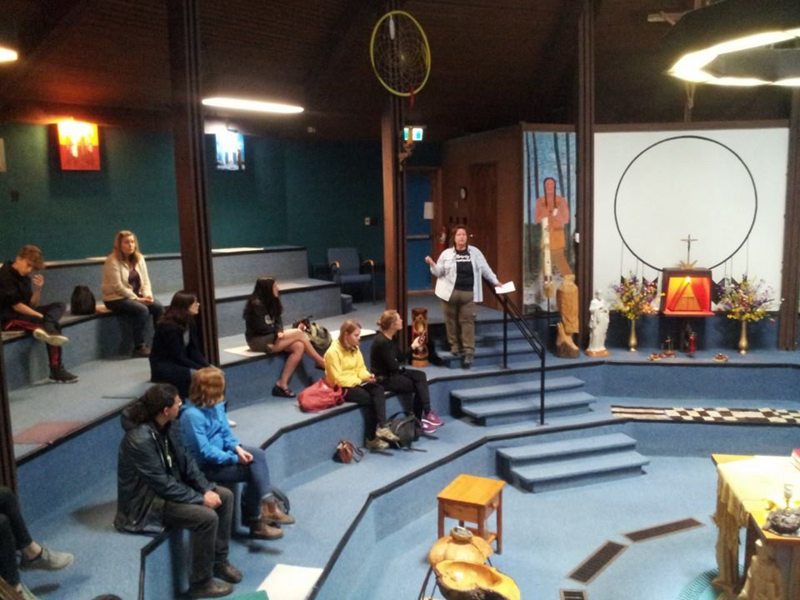 In the evening the group attended the OCF’s Aadziwin (Storyteller) series, listening to a talk on the protocols of berry fasting by Elder Marie Eshkibok-Trudeau (Wikwemikong FN), and learning about how Anishinaabeg preserved their cultural knowledge despite the dislocation caused by residential schools. We turned to our specialized theme of doodemag and manidoog on our fourth day. Alan Corbiere gave a talk about clan symbols in Anishinaabe culture and discussed how they are passed on through families and functioned as a form of social governance. Later in the morning, we visited the Immaculate Conception Church at M’Chigeeng, where Professor Theresa Smith of Indiana University of Pennsylvania discussed the persistence of Anishinaabe worldview in Catholic practices and architecture. After lunch participants visited Whitefish River First Nation, immediately north of Manitoulin Island. On Birch Island, Deborah McGregor and her mother Marion met us on the reserve’s ceremonial grounds to give us a lecture on the protocols of sacred sites and the history and significance of Dreamer’s Rock. Deborah then led the group on a hike to the sacred site of Dreamer’s Rock, where for millennia Anishinaabeg gathered for ceremonies, sweat lodges, and vision quests. During dinner at an Anishinaabe-run restaurant, Abby’s, in M’Chigeeng First Nation, a young powwow dancer, Pierre Debassige, spoke to us about powwow protocols and explained his regalia, underscoring the vitality of ancient Anishinaabe ceremonies. On our fifth day the WHO hosted us at Wikwemikong First Nation on the eastern part of the island. In the morning we met with knowledge carrier Steven George (Wikwemikong FN) at the Holy Cross Roman Catholic Church, which is a model of mixing Anishinaabe spirituality with Catholicism. Steven spoke to us about the history of his community, and the ways in which its members have resisted colonization, especially focusing on 20th-century policies of the federal Department of Indian Affairs. After lunching among the ruins of a residential and industrial school, which has been transformed into an open-air theatre by the De-ba-jeh-mu-jig Theatre Group, knowledge-carrier and WHO cultural officer Brian Peltier (Wikwemikong FN) led the group on a 10 km medicine walk along the Bebamike Memorial Trail. Our group divided in two on the sixth day. Half participated in a porcupine quill art workshop hosted by Mina and Ted Toulouse, who are widely renowned experts in the art. The other half travelled to Little Current for a boat tour of the northeastern shore of Lake Huron, led by Wasse-Giizhik Tours, owned and operated by Luke Wassegijig (Wikwemikong FN). In addition to experiencing Manitoulin from the water, we visited pitcographs at a site of a 17th-century Anishinaabe/ Haudenosaunee conflict, an old saw mill from the 19th century, and an old Anishinaabe village site from the early 20th century. After our closing feast at the OCF, Elder Lewis Debassige provided a closing address, summing up all the themes of the summer institute, and officially ended the formal part of the institute with a prayer. In the last two days of MISHI we visited traditional powwows at Sheshegwaning First Nation on the northern shoreline of Manitoulin at its western edge and Wikwemikong at the eastern edge. What makes MISHI a success every year is that it is built on collaboration, not just among co-organizers and participants, but also among institutions and pedagogies. The program would feel colonial if participants only came to the OCF to learn; in exchange, participants contribute to the OCF through transcribing recordings for its archives, creating educational booklets for use in First Nation schools, and bringing their own projects to share with the OCF. MISHI 2018 participants are also developing protocols and instructions for researchers who wish to work with the OCF collections. The diverse academic and institutional backgrounds of the participants will enrich the protocols and assist the OCF to engage with a wide range of scholars. Likewise, the richness of the MISHI program, exploring worldviews from spiritual, artistic, and historical perspectives, digging clay, weaving porcupine quills, and hiking through Wikwemikong, mirrored the holistic ways in which Anishinaabeg teach their young through stories and by doing. MISHI 2018 participants learned that everything is indeed connected, and that the spirits of the Thunderbirds and Turtles infuse powwows, residential school histories, and quillwork. Carolyn Podruchny is a professor of history at York University. MISHI was organized by Carolyn Podruchny (co-founder of HIP Network, York University), Anong Beam (curator and acting executive director of the OCF, M’Chigeeng First Nation), Lewis Debassige (Elder and co-founder of the OCF, M’Chigeeng First Nation), Alan Corbiere (former Executive Director of the OCF, M’Chigeeng First Nation) and Deborah McGregor (York University, Whitefish River First Nation).